I love food. Savoury or sweet, hot or cold – you name it, I love it. So if you gave me the chance to demolish a load of chocolate for the chance to win even more chocolate, you’d better believe I’m taking you up on that offer. Even if you told me only three per cent of people had actually succeeded at the challenge, I’d still probably drastically overestimate my abilities and take it on. Which is exactly what Slattery’s Patissier and Chocolatier in Whitefield, Greater Manchester, wants people to do as they call on chocolate lovers to take on their epic challenge. The shop has become renowned for its chocolate challenge in recent years, which thousands have attempted, but only three per cent have taken away the prize for. 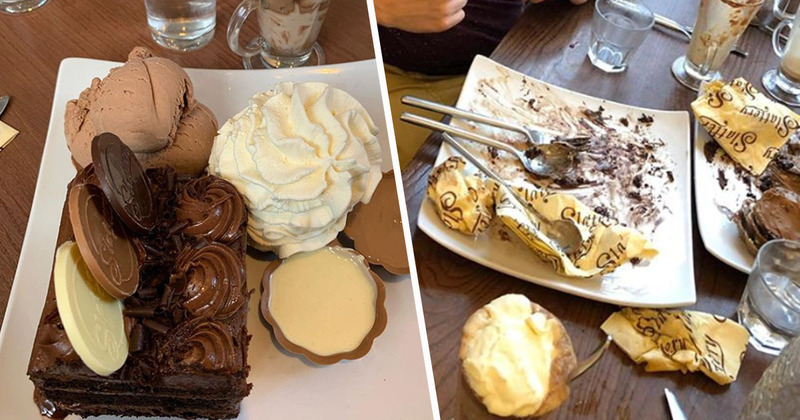 Challenging people to take on a large portion of American-style chocolate fudge cake, homemade chocolate ice cream, fresh cream and two chocolate pots filled with liquid chocolate sauce, Slattery’s also requires you to finish off a hot chocolate before you can be crowned winner. Also believing the challenge to be easy was Emma Gill, from Manchester Evening News, who believed her and her husband had it ‘in the bag’ and were surely going to be crowned the new winners. That was, until their plates got brought out and they realised the portion sizes were ‘a whole lot bigger’ than they thought they would be. I know what you’re thinking. I could do that. But trust me, it ain’t that simple. The cake alone is enough for three decent-sized slices and comes with three large chocolate coins on the top – milk, dark and white. Just getting through that is a task in itself. In fact we failed, miserably. Yeah, my confidence is already wavering and I haven’t even seen the dessert in person yet. God knows how I’d feel if I actually had to sit in front of the chocolate and stare down at the beast. The couple weren’t the only ones to fail at the monstrous task though; a massive 8,000 people have attempted to take on the challenge since 2012, with only 241 (three per cent) succeeding. Restaurant manager Mark Walker told the MEN the repercussions of those who tried to force the chocolate down when they perhaps shouldn’t have. We had one lady who was here for her 40th and she was going for it. But at the end she stood up to leave and it just all came up. Another lady’s white coat was just covered in chocolate, she was so embarrassed. Yikes, I wouldn’t want to be that woman. Well, either of them for that matter. Slattery’s website warns the challenge is ‘suitable only for serious chocoholics,’ followed by not one but two explanation marks, which should give you a hint at how serious they are about it. Any person who successfully demolishes the £15.95 challenge wins a Slattery chocolate medal and a 100g box of chocolate. Which I’m sure gets left in a cupboard somewhere for at least a week until they can face chocolate again.